Transport your expressed breastmilk or food in style with Hailey Cooler 3-in-1 Sling/Bacpack. You can use it as a tote, sling bag or backpack, depending on your personal preferences, fashion and lifetsyle. This rugged cooler will help keep everything to temperature for 6 to 10 hours depending on the types of ice packs/ice sheets used. A plus point is that, the outer material used is naturally heat resistant! To support expressing moms further, we have created the purchase with purchase promo for the various choices of ice sheets and ice packs we have too, with the purchase of this Hailey cooler tote. 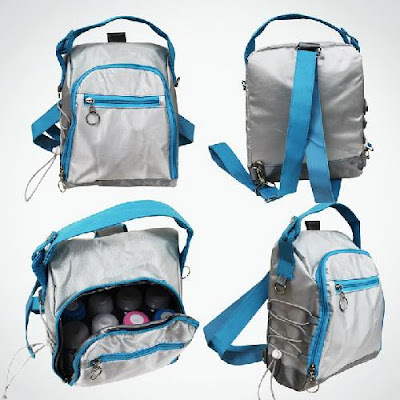 Trimmed in baby blue piping, this cooler includes a zippered pocket for your cell phone or keys. There is a button at the handle's strap, which will allow you to unbutton and hang the tote at the stroller, your document bag, etc... for easy travelling. It's a small but thoughtful feature by Hailey! It fits 8 standard neck bottles or 6 wide neck bottles comfortably.